The following is the third part of a three-part blog series on dynamic content management through IWCO Direct 1to1. Catch up by reading part one, an introduction to IWCO Direct 1to1, and part two, a look at the tool in action. Almost 60 years ago, the late Harvard Business School professor Theodore Leavitt coined the term “marketing myopia.” Leavitt is probably best known for the statement, “people don’t want a quarter-inch drill, they want a quarter-inch hole,” which is how he helped students understand the concept of marketing myopia. His example of the hole as what people really want when they buy a drill became the centerpiece of Jobs To Be Done (JTBD) theory. If you read the first two installments of this three-part blog series on dynamic content management (DCM), you may be wondering how JTBD applies to DCM. The answer lies in our approach to innovation. Rather than simply bringing a new product or service to market as many companies do, we took the time to understand our customers’ entire job to be done—from their perspective—and made that the mission of IWCO Direct 1to1. As we describe in our forthcoming white paper, one of the primary concerns for today’s marketer when introducing any new marketing tool, is the security and integrity of the system. Security and integrity are key elements of every direct marketing JTBD. Our experience working with clients in highly regulated verticals like financial services and healthcare taught us the importance of keeping client data secure and confidential. While the IWCO Direct 1to1 application is cloud-based, clients’ data is still securely transferred and then processed behind our firewall. Client data is not housed on the platform itself, so it is not exposed to potential security threats. Once the client data is processed behind the firewall, then the DCM application interacts with the data using its highly sophisticated Decisioning Engine (DE) to implement the clients’ business rules and logic. The DE replaces the need for manually driven logic, which reduces the risk of human error while also reducing overall resource effort in driving creative versioning and increasing levels of content personalization. A major property & casualty insurance company recently found their “quarter-inch hole” with IWCO Direct 1to1. 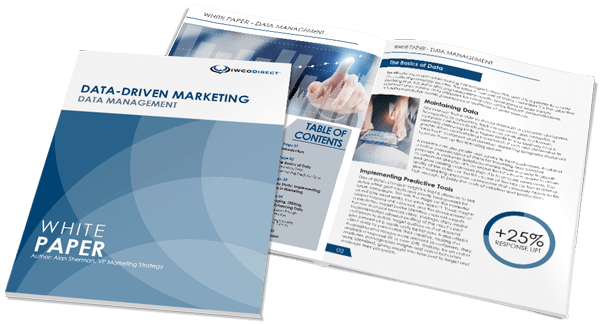 The success of the company’s direct marketing campaigns was based in part on their effective use of agent photos, location maps, and ability to provide variable insurance plan options. Ongoing changes to individual templates were time-consuming, resource intensive, and costly. The implementation of IWCO Direct 1to1 gave this insurance company a complete solution for image assets, content, and change management. They no longer need to rely on costly outside resources to make changes and can now see the result of their changes immediately in real-time. Once again, IWCO Direct 1to1 enabled an industry leader to increase their use of layout variability and complex targeting to accomplish their JTBD. Looking for an innovative, automated, configurable solution for your JTBD? Let’s talk soon.